Just as the Internet revolutionized the commerce landscape, mobile devices are set to do the same to the omnichannel shopping experience. While online and brick-and-mortar stores are still the primary place of purchase for many customers, smartphones and tablets are playing an increasingly larger role in the shopping process, whether consumers are reading reviews of items while in-store or looking up the locations of nearby locations. This is why the digital experience, particularly involving mobile devices, has become so important in recent years. Just half a decade ago, smartphones were considered to be the tools of businesspeople – the BlackBerry was often associated with top-level executives, helping them write emails and stay in touch with their employer even when they were out of the office. However, mobile devices have quickly transitioned into consumer-grade technology, and now nearly every household is home to multiple mobile devices from tablets to smartphones. More importantly, as mobile devices continue to become less expensive, the barrier for entry is getting lower and lower – gadgets that were once the playthings of C-level executives are now becoming commonplace, even in developing regions. Consumers all over the world are shopping with handheld devices. A recent white paper published by Innovative Retail Technologies noted how pervasive mobile technology truly is in modern eCommerce around the globe. For example, in May 2015 alone, European mobile commerce sales were up 48 percent. Meanwhile in China, Alibaba reported that mobile devices accounted for 42 percent of total business in the Chinese marketplace, a 36 percent rate of growth from the third quarter of 2014. In North America, Walmart reported that 70 percent of orders from the retailer’s digital business involved mobile channels. This just goes to show how vital mobile has already become to the online landscape, and illustrates some of the growth the channel has seen in recent times. Just as the Internet revolutionized the commerce landscape, mobile devices are set to do the same to the omnichannel shopping experience. While many retailers have taken great strides toward making mobile a part of their seamless omnichannel shopping experience, there is no denying that many merchants have not taken that step. Some have made only half-hearted efforts, for example by making a version of their website that is suitable for smartphones’ smaller screens. Others have taken no steps and are actively losing sales every time customers try to access their online stores from a mobile device. This is no longer enough. As the Innovative Retail Technologies white paper suggested, mobile is now the “digital glue” that ties the shopping experience together, particularly when it comes to transitioning from channel to channel. People use mobile to inform their shopping decisions, whether by checking inventory levels at nearby stores to see if an item is in stock, comparing prices in-store or quickly finding coupons as they wait in line. 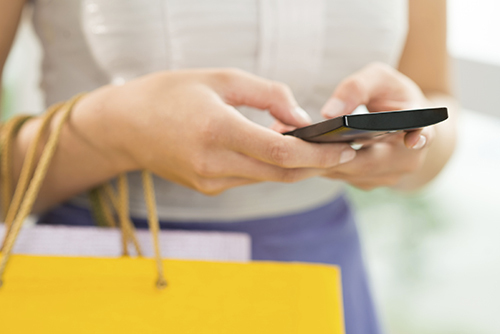 For retailers, that means mobile is more than a shopping channel. An effective mobile strategy no longer ends at creating a bite-sized website designed for smaller screens, or developing an app that acts essentially as a mobile site. Mobile devices need to be incorporated into every facet of the shopping experience. Creating mobile-friendly apps and websites is only the first step. Shopping apps must be more than digital catalogs – they need to engage the user and take advantage of the tactile nature of mobile devices. The approach will differ depending on the retailer, but offering fun activities such as mixing and matching outfits by dragging and dropping available products is just one way for merchants to create unique mobile shopping experiences. Smartphones and tablets, however, are not just tools for shopping and researching. They play pivotal roles inside the store as well, should retailers choose to incorporate them in that way. For example, beacons are one popular technology cropping up at many retail locations today. Beacons will transmit messages to customers as they walk down the aisles, or as they walk past the store on the street. These messages can be used to notify customer of specials or simply to send them messages designed to garner interest in product and service offerings. Mobile devices can be incorporated into the shopping experience in other ways, too. For example, retailers could integrate mobile payments and loyalty programs into their apps. This promotes greater flexibility at the point of sale, allowing shoppers to pay for goods however they want. Mobile loyalty programs are also effective because people can easily redeem and collect rewards – they do not have to worry about forgetting cards at home, since they will generally have their phones on them.